It has been a whirlwind of activity since Toronto Star (Canada’s largest nationally circulated newspaper) engaged Wendy in an editorial Chinese New Year style shoot. In just under 2 weeks, we had to design, plan and execute this richly detailed photo shoot. We were asked to create two table top designs that were each distinctively unique, but still reminiscent of Asian style and flair. The first look was created using the traditional palette of red and gold. The inspiration came from Wendy’s grandmother’s Mun Shou Longevity Chinese porcelain pattern. 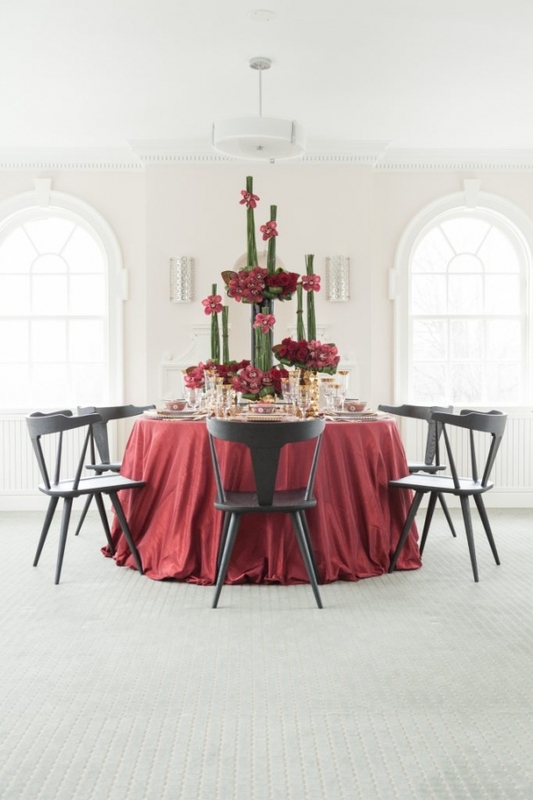 With this more traditional setting, Wendy asked The Social Rose to create a floral masterpiece in an Ikebana style. We think The Social Rose created a phenomenal tabletop centrepiece design!! Wendy worked really hard to garner as much exposure for the team’s shoot as much as possible. We are extremely grateful that so many other media outlets loved the team’s work. Thank you to Toronto Star, Elegant Weddings, EventSouce, OMNI Focus Cantonese, Calgary Bride, Real Wedding Canada, Cultural Wedding Planner, Strictly Weddings, Edbury Collections – UK and Her World Plus – Singapore for featuring our team’s talents. This traditional Asian inspired table designed was featured on a round table. This was deliberately chosen as most Chinese families would eat at home or in Chinese restaurants at round tables. Wendy paired black chairs that have a Zhen vibe but also had a mid-century modern style. 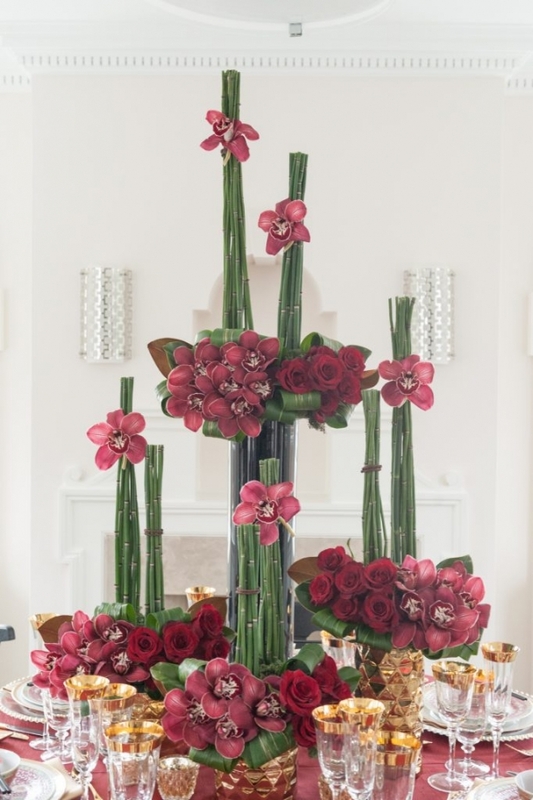 The floral arrangements featured deep red roses and cymbidium orchids. Popular blooms for Chinese weddings as well. 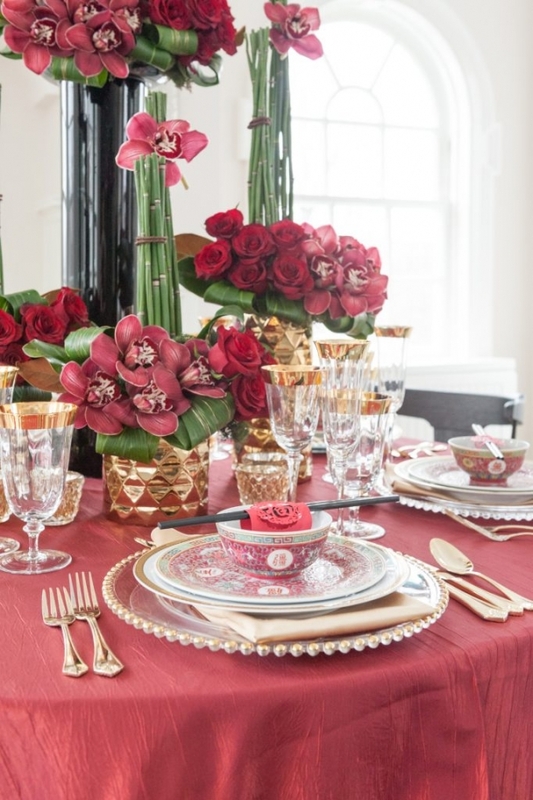 We showcased gold flatware, gold rimmed stemware and gold bead charger plates to accent the gold floral vases. Chinese households used the Mun Shou Chinese porcelain china pattern a lot in the past. These were from Wendy’s grandmother’s china collection. We adore this modern chopstick holder presentation – simply yet striking. It can be easily incorporated at a Chinese wedding. If you are going to be having formal dining celebrations, then it would not be complete without having custom made menus that are wrapped in material that mimic ostrich skin! We love the 3D laser cut paper rooster that adds the perfect touch to the sweets table, and check out those Fuji Apples!! Sweets table displaying things that would be symbolic to be eaten over the Chinese New Year 15 day festivities. The Tray of Togetherness is another symbolic presentation of meaningful foods to each over Chinese New Year. Chinese New Year celebrations would never be complete without the Lucky Red Envelopes!! Custom made ones are definitely more stylish.